This article is about the Nigerian local government area. For the tribe, see Andoni people. For a list of people named Andoni, see Andoni (given name). 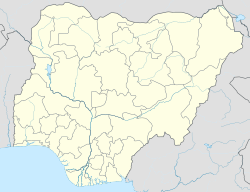 Andoni is a Local Government Area in Rivers State, Nigeria. Its headquarters is at Ngo Town. It has an area of over 233 km² and a population of over 311,500 at the last census. The postal code of the area is 504. This Rivers State location article is a stub. You can help Wikipedia by expanding it.